True Hearts by James AllenTM is our premier collection of ideal cut diamonds, available in round cut (Hearts and Arrows diamonds), princess cut, and cushion cut. At the heart of our True HeartsTM collection are round cut diamonds. These superior Hearts and Arrows diamonds feature perfect proportions and symmetry, as well as the highest grades for cut and polish. When viewed from certain angles, they reveal intricate patterns of hearts and arrows. The stones are polished with great precision, yielding an internal reflection of arrows when viewed from above and hearts when viewed from below. This effect is incredibly hard to achieve for even the most skilled diamond cutters. 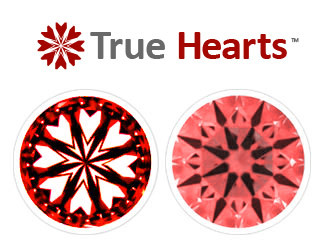 All True HeartsTM round cut diamonds on JamesAllen.com are displayed alongside actual images of their unique hearts and arrows patterns. These red and white ‘Ideal Scope’ images also serve as a clear indication of a diamond’s perfect optical symmetry. A certificate from one of the world’s top grading laboratories – the GIA or AGS – accompanies each Hearts and Arrows diamond, verifying its superior quality. This document contains information about a diamond’s cut, polish, and symmetry, among other important attributes. For a princess cut or cushion cut diamond to qualify as a True HeartsTM diamond, it must be certified as an Ideal Cut by the AGS. This involves measuring a stone’s light performance - that is, how it reflects and bends the light to produce brilliance - as well as other characteristics such as cut, polish, and symmetry. All True HeartsTM princess cut and cushion cut diamonds on JamesAllen.com come with an AGS-certified Platinum Light Performance Diamond Quality Document. Fewer than 1% of the world’s diamonds have the perfect internal symmetry and proportions necessary to earn the True HeartsTM distinction.